04/19/2016 Washington D.C. (International Christian Concern) – International Christian Concern (ICC) has just learned that the wife of a church leader in the central Chinese province of Henan was buried alive with her husband underneath the rubble of their freshly demolished church where she suffocated and died. On April 14, a demolition team was instructed to begin the demolition of the Beitou Church in Zhumadian, Henan Province to pave the way for new developers to take ownership of the lucrative property. The church leader, Li Jiangong and wife Ding Cuimei, stood in front of the bulldozers in an attempt to stop the destruction of their church. As a result, both Li and his wife were buried beneath the dirt by the demolition team. 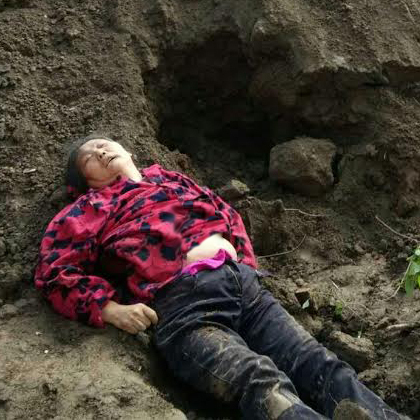 Ding Cuimei suffocated under the weight of the dirt released by the bulldozer while her husband was able to dig his way to the surface. The responsible individuals have been subsequently detained by local authorities due to pressure from the media. Bulldozing and burying alive Ding Cuimei, a peaceful and devout Christian woman, was a cruel, murderous act! Bob Fu, President of China Aid, said in a press statement. The events which took place in Zhumandian, Henan Province are an example of an ongoing pattern within the Chinese government’s “Three rectifications, one demolition,” campaign. Over 2,000 church crosses have been forcibly removed across the country by the government in an attempt to reduce foreign influence upon the Chinese people. While most cases involving church members standing between demolition crews and the church end peacefully, the death of Ding Cuimei has the potential to become a larger piece in an ever evolving mosaic between the government and the Christian community.